Do you have a place in your garden, or your allotment, that feels most like your sanctuary? One of the smallest corners in my small garden is shaping up to be sanctuary for me. Yes, I can hear the teenagers at the market cross just beyond my wall doing their Saturday night shrieking from time to time. But on my side of the wall — an ancient structure maybe 10 feet high, so reassuringly solid — a tiny seating area and a few plants tolerant of the basement garden-like conditions help make this a place of private perfection, or as near as makes no difference. When I began the garden seven years ago, I remember I tried to fashion this as my Boston corner. I put in Virginia creeper for the flaming autumn colour of the New England sugar maples, and potted rhododendrons to remind me of those whose leaves were my temperature gauge each winter when I was growing up: as you probably know, rhodo leaves conveniently curl into cigars when temperatures hit freezing. I bet it’s that nod to childhood, plus the protected-but-not-claustrophobic feeling of the high wall on one side, that gives this space a certain atmosphere that makes me want to come here when I have a moment. It’s also right outside my office window, and as my inexpert design tweaks over the last few years have nudged this area closer to what I want, it’s become the ideal place to rest my eyes as I try to think of the right verb for something I’m writing. Shall I tell you what’s planted here now? Well, to start, the area is no more than 9′ x 7′ and faces south, but it only gets direct sun from around 12 to 2:30pm in summer. Red rose for contrast: The south facing wall is made mostly of the two French doors leading out from my office; the deeply fragrant climbing red rose from David Austin, Falstaff, is to the left of these doors on a scrolled metal trellis. 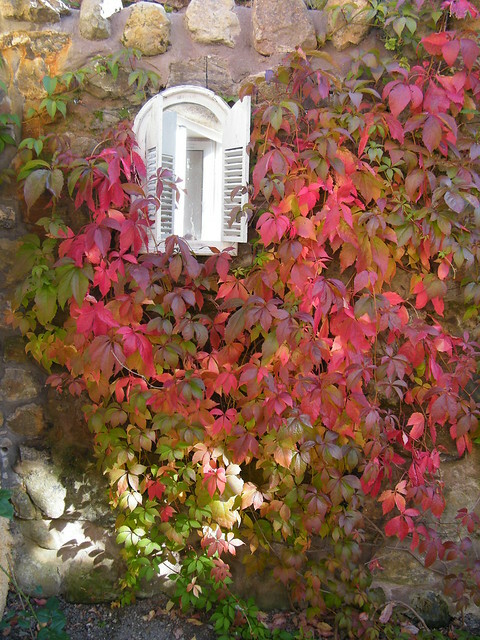 Vine for autumn colour: The west facing wall is the tall stone one and hosts the Virginia creeper, which is making its way around the south wall to the top of the trellis. Rose for shade tolerance: The north facing wall is only chest high — it has cream colored harling (aka pebble dash), and it’s the retaining wall for the raised border that runs along one side of the house. That’s where I’ve trained the magnificent Old Glory rose, Gloire de Dijon, against a pretty pair of scrolled metal structures: not trellises, but narrow, window-shaped things designed to be wall planters. I know this rose’s magnificence only by reputation; it hasn’t flowered for me yet, but this year it’s looking promising. Why is it so much more rewarding to nurse something ailing and see it come back strongly? This rose is shade-tolerant but has struggled since I planted it; I cut back its weak growth in May and the regrowth has been vigorous. Rhododendron for nostalgia: The east facing wall is three full-length windows which look into the house. By these windows the entrance to a gravel path, 4 feet wide, leads out of this cosy corner to run between the raised border on one side and the house on in the other. Tucked at the side of this entrance to the gravel path is a potted “Purple Splendor” rhododendron, which shares its tub with a pieris. Late last night, despite the darkness, I couldn’t resist a sit and a think there for a half an hour, with a cup of coffee and a lantern. Because it was only yesterday evening, having moved the potted rhodo and thinned out some of the pieris’s growth to make it fit that entrance, that I felt I’d struck on the right combination of elements for this space. My mum and I had tea in this corner when she was visiting; I wish she could sit there with me now. Have you heard Carol Klein (a UK television gardener and owner of Glebe Cottage Plants, if you don’t know her) speak of the flowers that remind her of her own late mother, an avid gardener in her own right who sadly suffered from depression? Carol speaks of how the simple harebell means more to her than almost any other plant, because of the connection it gives her to her mother. My mother lives 3,000 miles away; my father passed away 10 years ago. Is it memories of my home with them, and of the childhood that with every passing year becomes more rose-tinted, that has made this corner my sanctuary? Do you have a place or ritual that’s most special in your garden? I love sanctuary spaces in gardens. I have created a space in my garden–a gravelled area with a bench and lots of scented plants–lavender, pinks, herbs. Its a lovely place to sit and relax and view the garden. Another secluded space I have is in the vegetable garden next to the shed, no-one can see me there. Lots of plants in my garden remind me of people (those who’ve given me the plants) and places (where I got them from or special places where I’ve seen them growing). Thanks Margaret. As you say, seclusion and even secrecy is a big part of what makes the garden sanctuary special. I must get more scent into my corner; two young zaluzianskayas are ready to plant out so I think they will be next. Your two spaces sound wonderful! What a lovely space, Sheila. I’m afraid if I had a beautiful garden sanctuary right outside my office, I’d never have enough willpower to stay in the office! I, too, use rhododendron as a temperature gauge. One I have rolls up tighter and tighter as the temperatures get colder. When the air temp gets down below 10F, those rhododendron leaves look like needles.